NAGOYA, Japan (AP) — Coming off a strong showing against a team of Major League Baseball All-Stars, Japan manager Atsunori Inaba has every reason to be confident about his team’s chances of winning a gold medal at the 2020 Tokyo Olympics. The tour was a chance for Inaba to gauge the progress of his young players ahead of the Olympics their capital will be hosting in less than two years. 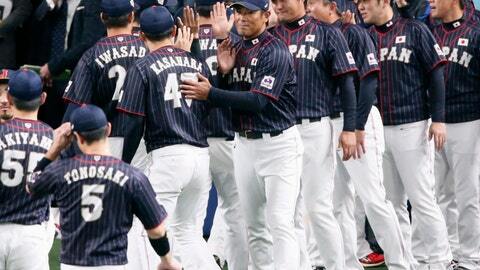 Players like 23-year-old Seiji Uebayashi and Sosuke Genda stepped up against the major leaguers and performed well. The host country has set an ambitious target of 30 gold medals at the 2020 Games and few would be more coveted than the top prize in baseball, the most popular sport in Japan. Japan has never won gold in the Olympics but won the World Baseball Classic in 2006 and 2009, and has produces players the caliber of Ichiro Suzuki and Shohei Ohtani. Miami Marlins manager Don Mattingly, who managed the MLB tour of Japan, said Japan has a good chance to win gold. Baseball will be returning to the Olympics for the first time since 2008, and part of the reason it was reinstated by the IOC was because of its popularity in Japan. Some of the games will be held in Fukushima, an area devastated by the 2011 earthquake, tsunami and nuclear disaster. Olympic organizers have been eager to use the games as a symbol of recovery from the disaster that hit Japan’s northeastern region including Fukushima, 240 kilometers (150 miles) north of Tokyo, where entire communities fled after meltdowns at the nuclear plant. More than 18,000 people died or went missing after the disaster. The IOC approved the use of Fukushima Azuma Baseball Stadium as an additional venue for baseball and softball, although Yokohama Stadium will be the main venue. Major league players won’t take part as the games are scheduled for July 24-Aug. 9 — in the middle of the MLB season. In 2008, players on major league 25-man rosters and disabled lists on June 26 were ineligible to play. The U.S. roster included 17 players from Triple-A, seven from Double-A and college pitcher Stephen Strasburg, now with the Washington Nationals. Mitch Haniger, who was part of the MLB tour of Japan, said he’d like to be a part of the Olympics. In 2020, the main competition for Inaba’s squad will likely come from traditional baseball powers like Cuba, the Dominican Republic and the U.S. The Cubans have won three gold medals in the event since baseball became a medal event in Barcelona in 1992, while the U.S. and South Korea have each won a gold medal. Japan’s previous best was a silver medal at Atlanta in ’96. Inaba’s squad is hoping to take that next step in Tokyo.